Breast implantation is a surgical procedure for enlarging, or augmenting, the breast. Implants are breast-shaped pouches that are saccular in shape, made of a silicone outer shell, and filled with silicone gel or saline (salt water), are used. Breast implantation is usually performed to make normal breasts larger for cosmetic purposes. Sometimes a woman having a breast reconstruction after a mastectomy will need the opposite breast enlarged to make the breasts more symmetrical. Breasts that are very unequal in size due to trauma or congenital deformity may also be equalized with an enlargement procedure. Photograph by Peter A. Simon. Phototake. Reproduced by permission. Male-to-female transsexuals may use breast implantation to achieve the physical appearance of a female. Breast enlargement is the second most common cosmetic surgical procedure practiced on women in the United States. It increased by 306% between 1992 and 1998. According to the American Society of Plastic and Reconstructive Surgeons, more than 125,000 breast augmentation procedures are performed each year. Presently, more than two million, or approximately 8%, of women in the United States have breast implants. The majority of breast implant recipients are Caucasian women (95%), followed by African-American women (4%). The remaining women that have breast implants are Asian (0.5%) and other non-specified races (0.5%). procedure may also be called breast augmentation or augmentation mammoplasty. The diagnosis for breast reconstruction is almost always visual. The underlying medical reasons include equalizing otherwise normal breasts that are markedly different in size, replacing all or part of breast tissue that has been removed during the course of cancer treatment, or replacing breast mass that has been lost due to injury. Underlying cosmetic reasons include personal preference for larger breasts among genetic females or the creation of breasts in male-to-female transsexuals. Before any surgery is performed, the woman should have a clear understanding of what her new breasts will look like. She and her physician should agree about the desired final result. Many surgeons find it helpful to have the patient review before and after pictures of other patients, to clarify expectations. Computer modeling is often used to assess expected results. A person in poor health or having a severe or chronic disease is not a good candidate for this procedure. Many normal activities such as driving may be restricted for up to one week. Sutures are usually removed in seven to 10 days. Typically, a woman can resume all routines, including vigorous exercise , in about three weeks. The scars will be red for approximately one month, but will fade to their final appearance within one to two years. Risks associated with this procedure are similar to those of any surgical procedure. These risks include bleeding, infection, reaction to anesthesia, or unexpected scarring. A breast enlargement may also result in decreased sensation in the breast or interference with breastfeeding. Implants can also make it more difficult to read and interpret mammograms, possibly delaying breast cancer detection. Also, the implant itself can rupture and leak, or become displaced. A thick scar that normally forms around the implant, called a capsule, can become very hard. This is called capsular contracture, and may result in pain and possible altered appearance of the breast. The chances that these problems will occur increase with the age of the implant. There has been intermittent publicity about possible health risks associated with breast implants. 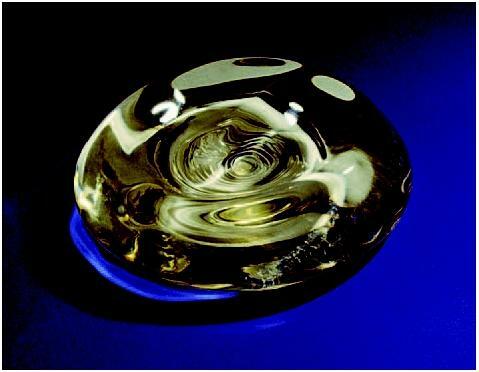 Most concerns have focused on silicone gel-filled implants that leaked or ruptured. In 1992, the Food and Drug Administration (FDA) restricted the use of this type of implant and ordered further studies. Today only saline-filled implants are used for cosmetic breast surgery. Recent studies have shown no evidence of long-term health risks from intact silicone implants. However, research on possible links between these implants and autoimmune or connective tissue diseases is continuing. Breasts of expected size and appearance are the normal results of this surgery. Normal scar formation should be expected. With any silicone prosthesis, a capsule usually forms around it. However, in some instances a mild form of capsular contraction ensues. Mild ridges that can be felt under the skin categorize this condition. The capsule contracts, which occurs occasionally, and can result in a hardening of the breast. There is no way to predict who will excessively scar. In addition to scarring, other risks include infection, excessive bleeding, problems associated with anesthesia, rupturing of the implant, and leakage. There have been a total of 120,000 reports of ruptured silicone implants. Approximately 50,000 reports of breakage have been received for saline implants. Deaths associated with breast augmentation are extremely rare. Most post surgical mortality has been attributed to anesthesia errors or overdoses of pain medications. Alternatives to breast implant surgery include using external breast forms that fit into brassiere cups or are attached to the skin of the chest. Creams that allege to increase breast size usually produce no noticeable results. The use of creams containing hormones can lead to long-term hormonal imbalance. Reputable experts do not generally recommend these preparations for breast enlargement. Berger, Karen J., and John Bostwick. A Woman's Decision: Breast Care, Treatment & Reconstruction, 3rd edition. St. Louis: Quality Medical Publishers, 1998. Bostwick, John. Plastic and Reconstructive Breast Surgery. 2nd edition. St. Louis: Quality Medical Publishers, 1999. Hudson, D. A. "Submuscle Saline Breast Augmentation: Are We Making Sense in the New Millennium?" Aesthetic and Plastic Surgery 26, no. 4 (2002): 287–290. Jejurikar, S.S., J. M. Rovak, W. M. Kuzon Jr., K. C. Chung, S. V. Kotsis, and P. S. Cederna. "Evaluation of Plastic Surgery Information on the Internet." Annals of Plastic Surgery 49, no. 5 (2002): 460–465. American Society of Cosmetic Breast Surgery. Information about Breast Surgery. 2003 [cited February 24, 2003]. http://www.breast-implant.org . National Library of Medicine. Breast Implants. 2003 [cited February 24, 2003]. <http://www.nlm.nih.gov/medline plus/breastimplantsbreastreconstruction.htm> . Public Broadcasting System. Breast Implants on Trial. 2003 [cited February 24, 2003]. http://www.pbs.org/wgbh/pages/frontline/implants/cron.html . US Food and Drug Administration. Breast Implants. 2003 [cited February 24, 2003]. http://www.fda.gov/cdrh/breastimplants/labeling/mentor_patient_labeling_5900.htm . Breast augmentation is normally performed by a surgeon with advanced training in plastic and reconstructive procedures. It is typically performed as an outpatient procedure.